I had the privilege of meeting Clarence at The Writer’s Center in Bethesda, MD, where we were both scheduled to do a reading. Afterwards, it struck me how, despite the book jacket’s descriptive power, so much of Clarence’s spirit and talent could only be captured in person, in the passion with which he read from Needs. My recommendation? If you want to hear an extraordinarily authentic voice, buy the book; and if you want to meet an extraordinarily authentic artist, go to his next reading, where ever it happens to be. HUERGO: What sparks your creativity and the urge to write? drained when I finish a project, as if there’s nothing left. Seems, when I’m writing, that I tune out everything, and when I’m not writing I open up to everything, feel more. BROWN: I get an idea and I start writing. When I finish, I go back and write more, or less, into the manuscript. I think I draw from my own feelings so heavily that I have to look at the manuscript again before I can begin to feel what others feel, see what others see. I guess that’s when I can complete what I started. I was born in Charlottesville, Virginia, in 1961—a time when well-meaning white people were trying their hands at doing the right thing. I remember my classrooms being divided down the middle, whites on one side and blacks on the other. I didn’t understand why I was seated on the “white side” until later in life, but it made me plenty of enemies among my own people and created lots of resentment among the whites, so I just stayed to myself. I could be found at the library when I wasn’t home. There was a world there that I could just disappear into, not worry about what I looked like or what someone else thought. I felt that someone was just too kind for creating this world that was so perfect for me. I didn’t have to sound black or white nor appear to have money—just read and devour all this imagination laid out for me. As I grew older, I thought that I might have something to say. The writers I’d read made me feel as if I could do it, too. Ray Bradbury and Robert Heinlein, and later, Octavia Butler, created worlds that made sense to me. People were too busy surviving to worry about skin color. What I’ve found now is that it took me 26 years of dodging life and the hardship of a heroin addiction to give me a story of substance. I was no longer writing poetry to impress the women I met. Now I had a tale to tell. Needs and its sequel are a combination of what I’ve observed and my own life. I am all the characters, male and female, and they say what I did and say what I cannot. BROWN: It feels to me that getting stuck has to do with that running out of observations I mentioned earlier. What I’ve done has been to put whatever I’m working on down. I take the time to replenish my pool of observations. Sometimes that takes more time than I realize. BROWN: An author, Octavia Butler, was my favorite. Her freedom of imagination and the reality, the immediacy of her characters, was a source of delight and envy. The fact that, as a teen-aged black youth, I’d never known of a black, female science-fiction writer was an uplifting and motivating factor. I also know two men, Bob Jones and Neil Hertz. They taught me that it was possible for me to write as I’d dreamed of, to say what I meant to say truthfully, in a way that would be of interest to a hungry reader. 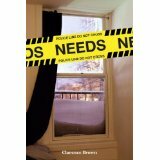 BROWN: Right now, I’m revising the sequel to Needs, my first novel. It’s growing, this community of people who feel what we all feel, and I’m having to look at whether I’m being true to them or trying to sell books. Of course, like any author, I dream of best-seller success, but I need to learn more about myself first. Then I can truly tell our story. 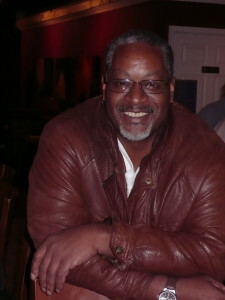 This entry was posted in Interviews with Poets & Writers and tagged Bob Jones, Brick House Books, Charlottesville, Clarence Brown, Clarinda Harriss, NEEDS, Neil Hertz, Octavia Butler, Ray Bradbury, Robert Heinlein, The Writer's Center on July 21, 2013 by ehuergo.